Due to some bad planning and a rather rushed weekend I managed to end up with a rather large handful of uncooked shell-on king prawns I had to cook. That, or they would have gone to waste! Now I don't believe in wasting anything, and I try and find good ways of preserving if possible: freezing, curing, whatever makes most sense. In this case I had some stunning ingredients left over from the supper club so I thought I'd treat my flatmates to some special kebabs!! Here's what I made for them . . . . . 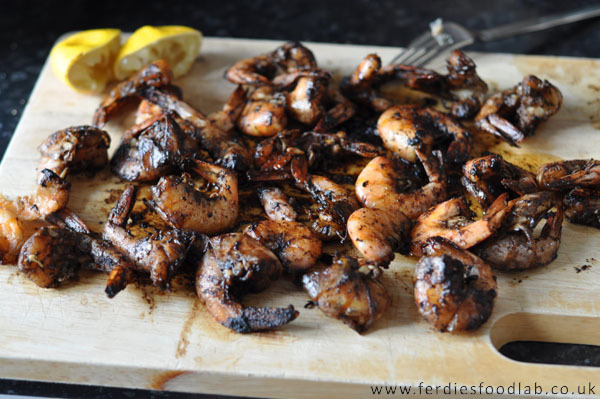 Lemon oil, black garlic and prawns are a fabulous combination of flavours! !